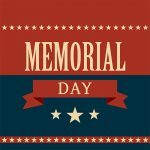 Don’t forget to record Memorial Day as “Holiday Taken Time Off” in Workday. This applies to most UW employees who accrue time off and who would normally work on the day on which the holiday falls. However, Department of Intercollegiate Athletic coaches and academic personnel (faculty, residents and fellows and other academic staff) do not need to track time off for holidays in Workday. Medical Centers employees report time off for holiday hours in Kronos. To see if this applies to you, review the quick guide and full user guide for time off, and check out related information on the Time Off page of the Integrated Service Center website.